Baguley Athletic have chosen Forever Manchester as their Charity of the Year. 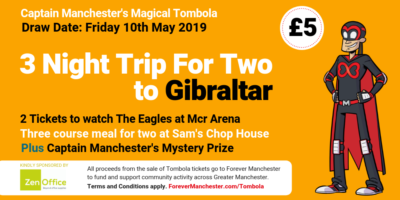 In September this year the club raised £100 at a charity football match for Forever Manchester where they won in dramatic fashion in a penalty shootout and they have now committed to supporting us for a year. Next year they hope to tackle a lot more challenges including a sky dive, which they’re hoping will raise a load of money to support grassroots clubs just like them. Look out for our features on the various activities Baguley will be taking part in over the next year, including photos of them flying without wings. The support of grassroots community groups such as Baguley Athletic is greatly appreciated, as it raises awareness of our cause and also raises awareness for community groups to apply for funding through us. If you want to support Forever Manchester as your Charity of the Year please contact marketing@forevermanchester.com and we will be in touch with you. Alternatively, if you’re a community group looking for funding, please visit our Apply for Funding page to see whether you’re eligible.